Reading: A constant frustration … or a secret of success? Every day, all day long, you're faced with "information overload." Facts, data and other information come at you from every direction — from the newspaper that lands on your doorstep to the emails, reports, memos and other correspondence that land on your desk and in your mailbox. It's an endless stream of material to read, understand, remember and act upon. Whether you thrive — or barely survive — hinges on your proficiency in processing so much information. If you're like most people, you simply don't have more time to devote to catching up on your reading. 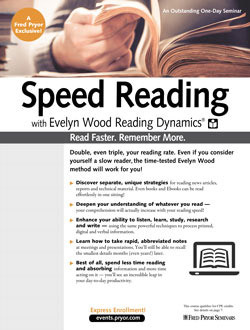 Put Evelyn Wood's world-famous, time-tested techniques to work for you, and you'll be reading faster right away … with greater comprehension and retention than you've ever experienced! Today's most respected leaders have taken advantage of the powerful benefits of Evelyn Wood Reading Dynamics. U.S. presidents, cabinet members, heads of state, legislators, Fortune 500 executives and CEOs, judges, scientists — graduates of this program are found at the top of every field. 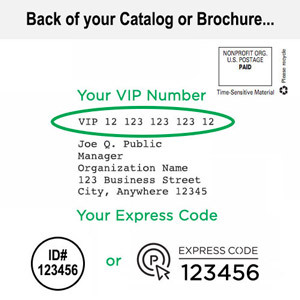 You, too, will benefit greatly from the remarkable results of this renowned program. You will learn not only how to multiply your reading speed but also how to feed more information into your brain, absorb it as fast as you can think and retain it. Train yourself to read vertically, and eliminate slow, unproductive "line reading"